We left early before 8:00 and were through the Nickajack Lock by 9:00AM. The rest of the cruise was easy and we were into Goose Pond at 1:30PM. We met a very interesting couple of emergency room MDs from New Hampshire on the dock. They are cruising the Great Loop in a fast outboard powered aluminum cuddy cabin boat. We had seen them pass us twice before on the river. They had just returned from riding their folding bikes into Scottsboro a distance of about 6 miles. At Scottsboro they were interviewed by the local newspaper and given the keys to the city by the mayor. For several years they canoed in the wilderness of Canada. They traveled the voyageur route all the way from Montreal to Inuvik on the Arctic Ocean by canoe. They are now thinking about getting a trawler. We had dinner at "The Docks" restaurant which is a short walk from the marina. The food is fantastic. I had the Shrimp and Grits (fresh gulf shrimp with southern stone ground grits served with andouille sausage and pepper cream sauce). 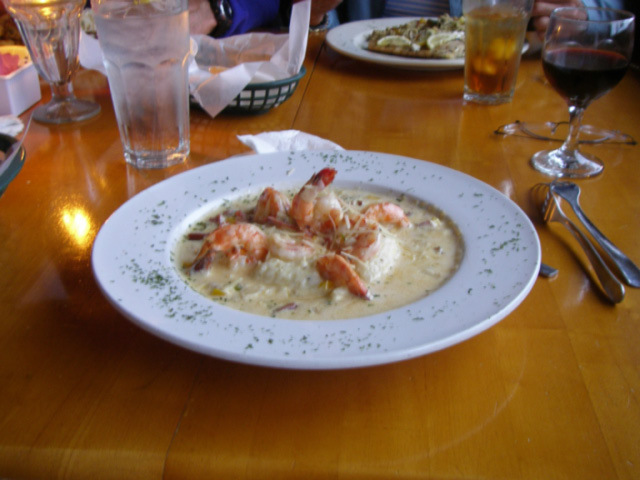 Would you believe that shrimp and grits go together and make a great meal(see photo)!